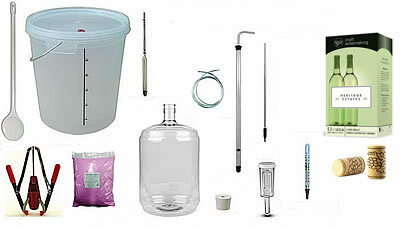 All the ingredients and equipment required to craft 30 bottles of your own wine. This kit contains all the equipment and ingredients needed to start crafting your own wine! You just choose what type of wine you want to make - a red or a white - and we will send you one of our best selling ingredient kits. 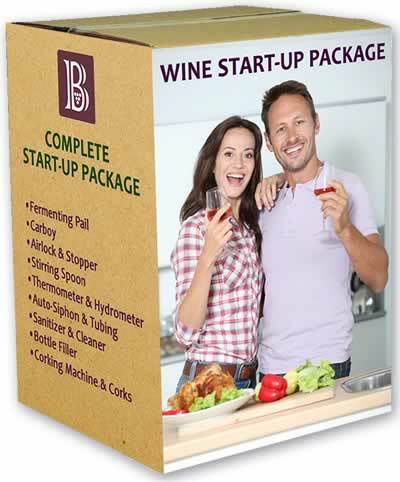 Your kit will make 30 bottles of quality wine. Full instructions are included in your wine ingredient kit. Your equipment can then be used to make wine over and over again. All you need to do is purchase another wine ingredient kit. A 32 litre primary fermenting pail with lid. 23 litre PET plastic carboy. Air lock with bored rubber stopper. A long handle plastic stirring spoon. Note:The package illustrated is for display only. Your start-up package will arrive in a plain unmarked box. Options Equipment only. No ingredients included. All the necessary equipment to make beer, wine or alcohol base for liqueurs & spirits. Options All the equipment & ingredients to craft 66 bottles of beer. Options Equipment and additives to make wine from fruit and berries.